Although Indian food has a rich and complicated history, the secret to making it is very simple. The best food is always created with love. And love demands that you make no compromises or take no shortcuts. Call them old fashioned, since established in 1997, The Host Fine Indian Cuisine haven’t changed their cooking techniques. Connoisseurs of food, you are welcome. 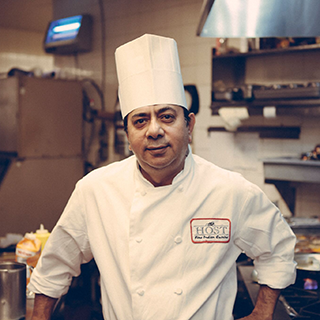 Sanjeev’s professional expertise is acquired in the blaze of the kitchen fire, and his achievements acquired through ingenuity and perseverance. He relies on the tradition to create his recipes but turns them into modern preparations so that they adhere to the contemporary tastes. In blending the traditional with the contemporary, he strives to maintain a fine and intricate balance to achieve authenticity.